Eassos iPhone data recovery software helps to get back lost data from iPhone, iPad & iPod Touch. It can recover lost contacts, SMS, notes, videos, photos, messages, call history, bookmarks, voice memos, message attachments, etc. It supports recovering data from iOS device directly as well extracting data from iTunes or iCloud backup. It is fully compatible with the latest iOS system and devices.Main features:Completely and safely recover lost data from iOS device due to deletion, formatting, device damage, failed upgrade, etc. 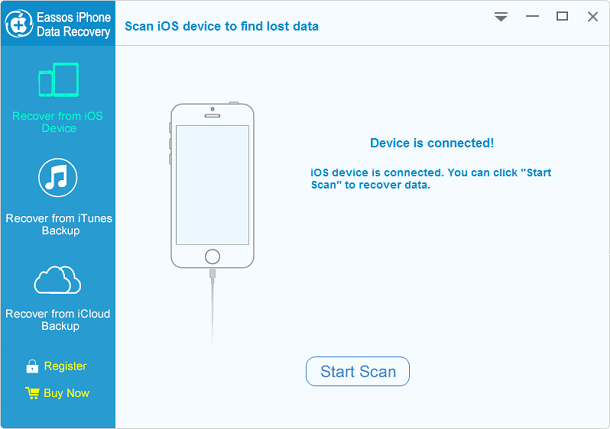 Multiple recovery modes enable you to recover lost data from iOS device directly or restore data from an iCloud or iTunes backup. Preview before recovery. You can preview photos, video & audio files, text data, etc. with original quality before actual recovery.Support all iOS device models, including Phone X, iPhone 8/8 Plus, iPhone 7/7 Plus/6/6 Plus/5S/5C/5, iPhone 4S, iPhone 4, iPhone 3GS, iPad 1, iPod touch 4, iPad mini 1/2, iPad Air 1/2, iPad with Retina Display, the new iPad, iPad 2, iPod touch 5 and iPad 1It's easy-to-use. The user friendly interface gives clear instructions for initiating recovery.Fully compatible with iOS 11 and iTunes 12.7Supported Operating Systems: Windows 10/8.1/8/7/XP/Vista. directly as well extracting data from iTunes or iCloud backup. It is fully compatible with the latest iOS system and devices.